Edited now for the first time by Duncan Wu, it provides students and general readers alike with an approachable introduction to Wordsworth's greatest work. Duncan Wu is Reader in English Literature at Glasgow University. He has edited Blackwell's Romanticism: An Anthology (1994) and Romanticism: A Critical Reader (1995). His Romantic Women Poets: An Anthology was published by Blackwell in 1997. He is also editor of the Blackwell Companion to Romanticism. Appendix I: The Analogy Passage. Appendix II: The Schedule of Manuscripts. "We see the embryo but not the complete birth, and it is thoroughly useful to have this version in readable form. Reprinted after the text are four useful modern critical essays; the 'analogy passage' which appears in MS W after Snowdon but not in Dr Wu's or any other editorial text; then, most useful, a schedule indicating the precise sources of Dr Wu's text; a very full index." S. J. Harrison, Corpus Christi College, Oxford. * Provides hitherto unpublished version of major Wordsworth poems. * Offers clean text with invaluable annotations. 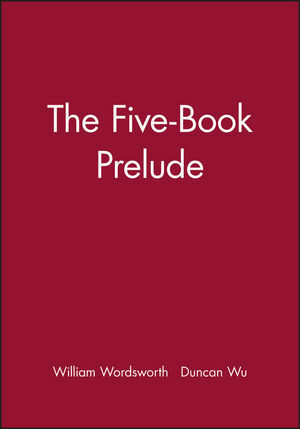 * Includes a comprehensive account of poem's evolution. * Collects recent critical commentary on the poem.